London City airport is one of the smaller airports but is very convenient for business travellers because of its close proximity to the city. Located just 22 minutes from Bank station, London City is the only airport located actually in London. For other airports like Gatwick and Heathrow you’ll have a longer journey getting to the airport. To get to the airport you can take a taxi or drive and park on-site. Alternatively the airport is easily accessible by public transport on the DLR. Flights that depart from here mainly go to Europe, but British Airways also offers a business class-only flight to New York via Ireland. This airport is therefore ideal if you’re travelling short-haul or you’d like a swift ‘private jet’ style journey to New York. Destinations served by London City include many European cities such as Amsterdam, Lisbon, Nice, Venice and Basel. Airlines utilising this airport include Alitalia, Aurigny (for Jersey), British Airways CityJet, Flybe, KLM, Lufthansa, Luxair, SkyWork Airlines, Swiss International Airlines and Tap Portugal. British Airways operates the most flights out of London City, offering Club Europe business class for European flights and Club World for long-haul flights to New York. Club World from London City features just 32 seats that convert into fully flat beds. 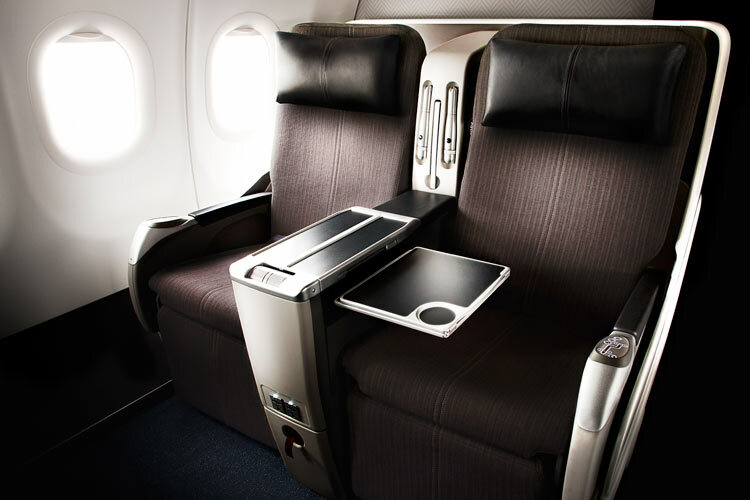 Each seat is equipped with UK, EU and US power sockets, as well as a personal iPad for watching entertainment. As a Business Class passenger you’ll also benefit from mobile data connectivity and pre-clearance of immigration before arriving in the US. London City airport has two airport lounges – a First Class lounge and a Business Class lounge. The Business Class lounge is located in London City Airport’s Jet Centre offering a fully catered kitchen area with a selection of cold food, snacks, refreshments and alcoholic beverages. A shuttle service is available to and from the airport, so passengers must check-in hold luggage before arrival at the Business Lounge or leave enough time to do so upon their return to the airport. To book business class from London City contact a SkyClub representative who can find the best possible fares for your journey. Either use the online form or contact us on 0207 255 1234. We’re a British Airways preferred partner and can offer you cheaper fares than those found on flight search engines.